Please click the provided links to be redirected to Target or Babies R Us. There are many ways to store and transport baby food. These are a few of the items I use, but by no means do I claim that you must use these products. I recommend them because they're affordable, proven to be convenient and durable, and have made my life much easier. While refrigerating and freezing does extend the life of your pureed baby food, there are still some safe storing techniques that you should put into practice. All fruits, veggies, meats and grains have varied preservation time lines, which should be followed. Remember, baby food stored in the fridge is best within 24 hours, but must be consumed or frozen within 72 hours. All thawed food should be used within 24 hours of removal from the freezer. The National Center for Home Food Preservation has a great website with Resources for Home Food Freezing, which includes instructions on how to properly freeze, store, and defrost food. They also include instruction on refreezing foods, and caring for your freezer. If you are interested in how well fruits, veggies, and grains will store, check out Wholesome Baby Food's Freezing Chart. This site outlines the foods that are better kept whole, diced or pureed, and lays out some of the fruits and veggies do not freeze well. An easy way to extend the life of your pureed baby food is to freeze it. Using regular household ice cube trays (that have been washed in hot, soapy water, rinsed, and air-dried) is super simple way to portion your baby's food before freezing. Simply spoon your pureed fruits, veggies, and meats into ice cube trays, cover with foil, label with contents and date, then freeze over night. 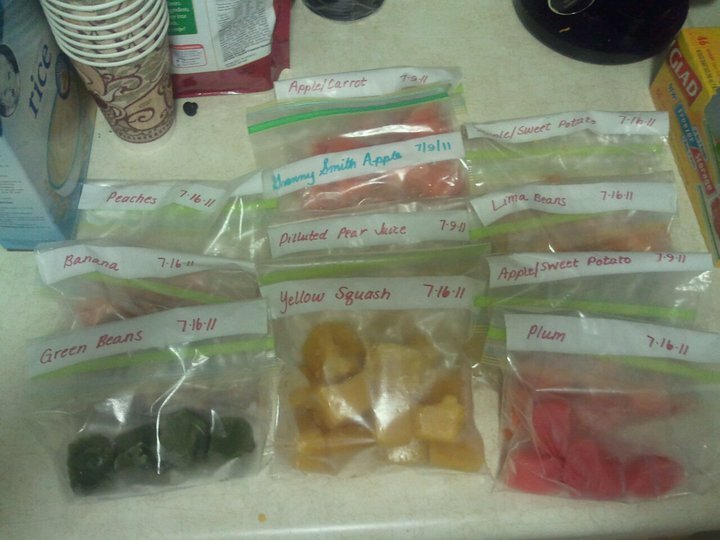 In the morning, pop the frozen cubes out of the trays, and transfer to labeled freezer bags. That's it! A standard ice cube is approximately 1oz, which makes it a cinch to thaw only what-you-need. You can thaw the cubes in the microwave or refrigerator, and consume within 24 hours. Using this method is also great for traveling with homemade baby food. You can toss frozen cubes into travel containers, and allow them to thaw as you're out and about. An ice cube is also the perfect portion for use with a net feeder for teething or hot summer days! Ice cube tray freezing also allows you to create new and different flavor combinations for your baby at every meal! Puree fruits and veggies individually, and then combine different mixtures when you thaw. Lucas enjoys Green Beans with Yellow Squash, and Bananas with Peaches and Plums! Individual Containers are great for small or relatively large portions of baby food. I highly recommend Take & Toss brand small, round containers. The 4oz size is perfect for one serving of baby food, but large enough to continue use for years. They come complete with lids, in bright colors, and are leak-proof. Very important to me and our busy lifestyle is that they are freezer, microwave are dishwasher safe. I absolutely LOVE these bowls! I originally received them as a gift, and didn't think that I would use them much, but it turned out to be the exact oposite. These bowls are also dishwasher, microwave, and freezer safe. 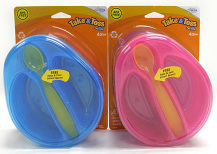 They come in pink or blue, and the spoons are multi-colored. The bowls are separated into two sections, which are 5 ounces each, perfect for a 4-oz portion of fruits, and a portion of veggies. In addition, there is a spot inside the bowl for a Take & Toss spoon. Each package comes with four bowls, but only one spoon. You can purchase extra spoons separately, which are very useful. Keeping the spoon inside the container always assures that you remember to bring one along, insures that you don't drop or lose it, and keeps it clean. The lids are a little hard to snap on, but once they're secure, the bowls don't leak. You can also use a dry erase marker to label and date the lids for safe food storage.